Summer is officially here, and many members of kids’ class – as well as teens and adults – are following new schedules and taking off on vacation. Please DO let Sensei Didi know what your schedule and participation will be for the summer months. Your martial arts instructors care about your individual progress, and plan your classes accordingly. 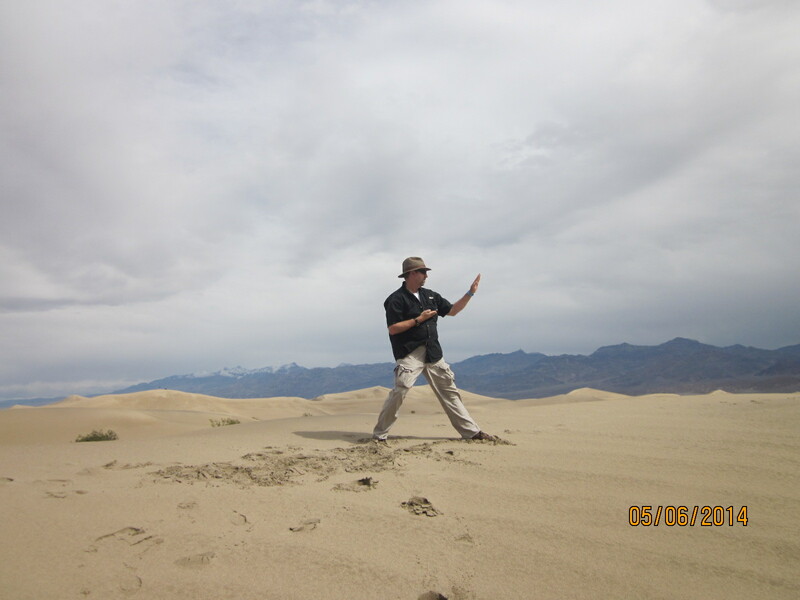 The “default expectation” in Cuong Nhu Karate is that you will be in class! Please let us know when you will be missing. Many of you have informed Sensei Didi of your summer plans, and she thanks you for your good manners. Adult class members Torfeh and Greg had a great idea. 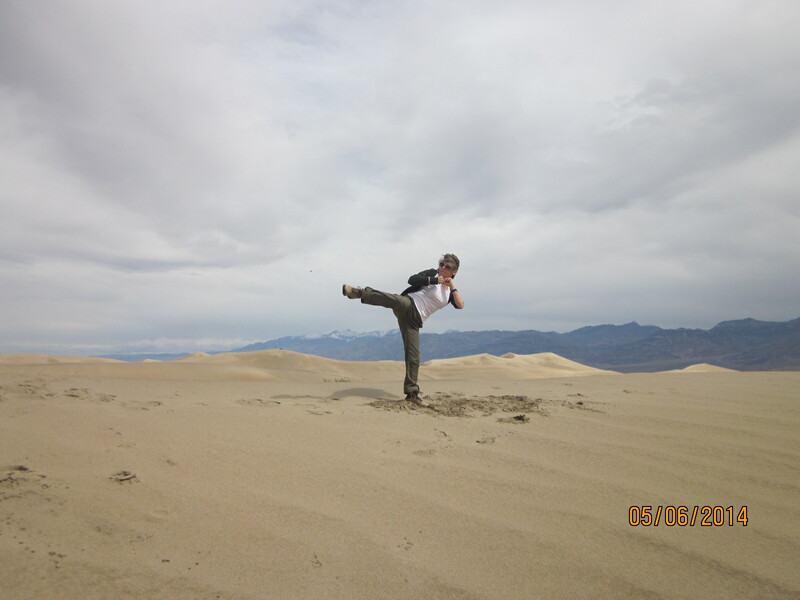 This summer, wherever you go for travel or fun, snap a picture of yourself in one of your favorite martial arts poses, and send it to redwoodojo[at]earthlink.net. We’ll post your pics here on the blog – like a postcard from your vacation. They’ve agreed to get things started with the two wonderful pictures from Death Valley you see here. One of our fine teen students and Leadership Program members, Danielle Pohlson, has been honored with an award for her involvement in community, school and softball. It’s called the Arnold Kelly Scholarship, and it puts away $1000 toward her future college tuition. Danielle is an outstanding softball athlete who makes a point to keep up her Cuong Nhu attendance during softball season, even finding extra time to come help with the kids’ classes. Congratulations, Danielle, on a well-deserved honor! Students who attend class today (June 23) or tomorrow, who are eligible for testing based on both attendance and knowledge of required curriculum, will be scheduled for an end-of-session test date. Unfortunately, if you are not in class, you cannot be evaluated for testing and you’ll have to wait a bit longer. Please contact Sensei Didi if you have any questions. We will be implementing our “Summer Holiday Schdule” this year, for the month of August only. During August, all kids, all ranks, will attend class together on Tuesdays and Thursdays from 5 to 6 p.m. Teens and Adults will train together from 6 to 7:30 p.m. The Peewee Class schedule for August is not yet set; keep an eye on this site for updates. Our normal schedule will resume, as always, in September. There will be a special Martin Luther King Day workout in the park for the Monday classes: Peewees at 4 p.m., age 6 & 7 at 5 p.m. Please wear shoes (no flip-flops), and if it’s cold out, dress warmly! The 5 p.m. class might end early (instructor’s discretion) since it gets dark by 6. In other news… The year is off to a great start, with kids’ classes bigger than ever. We love the high level of participation, and are also alert to the problem of keeping things focused and orderly in large groups. The instructors and I have many tricks up our sleeves, and we’ll pull them out as needed! Feedback from parents is always welcome. Martial arts isn’t just for kids; in fact, this is a great time for parents and other adults to get involved. Karate is such a popular activity for children these days, I think people sometimes forget that its origins are very serious and “grown up,” and traditional martial arts continues to be an excellent, long-term activity for adults interested in mental and physical fitness. Come check out our Adult Class on Tuesdays and Thursdays at 7 p.m., or Teen/Adult Class, Tuesdays and Thursdays at 6. The West Coast Training Camp instructors are arriving today! They’re coming in a day early to give dan-rank tests at Rohai Dojo (Berkeley Cuong Nhu Karate) in Berkeley. All kids classes, as well as Teen/Adult class, WILL meet today. However, Adult Class is cancelled today, as all instructors (and everyone else who’s able) will be in Berkeley to support Sensei Sara Falls, who is taking her shodan test. There will be no Saturday class at Redwood Dojo this Saturday, since we’ll all be at West Coast Training Camp! Please see our previous post for more details. You may also visit the Rohai Dojo website for information, including a schedule of classes. For those of you unfamiliar with (or new to) Cuong Nhu, ‘shodan’ means ‘first degree black belt.’ In our style, unlike many others, ‘black belt’ and ‘shodan’ are not the same thing. 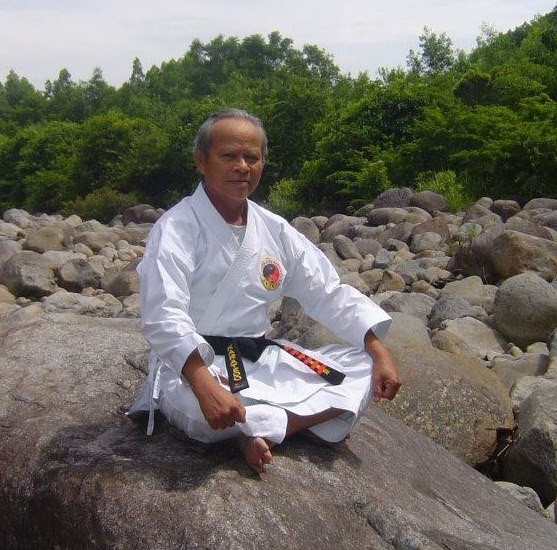 A Cuong Nhu student who passes a comprehensive test for black belt is not yet a ‘first degree black belt.’ To earn the title ‘shodan’ and the first red stripe on the belt, the student must continue to train and teach for 6 months to a year, at which time they must demonstrate proficiency in soft style. This includes performing the kata “Nhu 1” with applications, as well as demonstrating skill at soft style techniques learned previously. If you’re not able to attend Sensei Sara’s test this evening, send good thoughts her way!